In the age of craft, can post-prohibition laws stick? April is the cruelest month. Well, so said T. S. Eliot­. But the Anglo-American poet never made beer in Maryland. (Thus concludes my shout-out to fellow English majors). You see, beer-wise, April is shaping up to be pretty joyful for the state’s breweries. A couple of suds-friendly bills are working their way through the statehouse sausage-works down in Annapolis and (as of this writing) appear on track to become law. Maryland’s legislative session ends April 9. 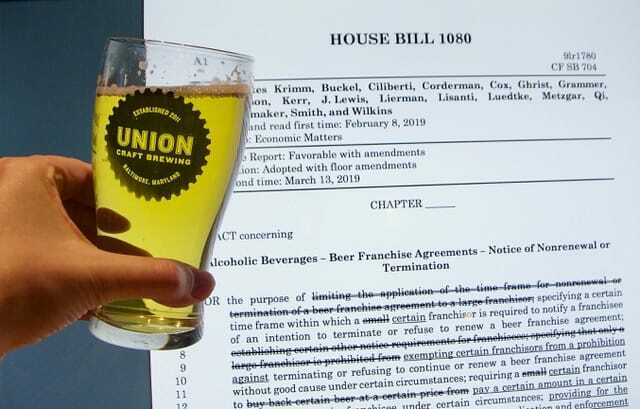 Another bill updates moribund, 45-year-old franchise laws to make it easier for brewers to change distributers or engage in self-distribution. While these nuts-and-bolts, backend doings aren’t likely to be on your mind while sampling the latest brute IPA or fruited gose at a local tasting room, they’re important to, well, allow you to keep doing so. Yeah, Naptown has not been too nice to craft brewing of late. In 2017, legislators changed laws to greenlight the conglomerate-owned Guinness brewery in Linthicum. A good thing. Alas, those same laws threw serious shade on homegrown brewers by curtailing taproom hours and birthing the absurd “buy back” requirement. Now, of course, we have to address the elephant in the room. In this case, really a donkey in form of Democrat comptroller Peter Franchot. There’s no doubt Pete is a big booster of craft brewing. I heard him discuss his Reform on Tap Act last year at Baltimore’s Wet City. It called for eliminating most all the state laws seen as handcuffing the brewing industry. Alas, the act never made it out of committee. While Franchot is a beer man through-and-through, he’s also somewhat of a polarizing figure in the insular and back-slapping world of Maryland politics. (There are plenty of political blogs that can fill you in on the backstory). Alas, Franchot is back in the spotlight this year as legislators are poised to strip his office of its regulatory authority over alcohol. Meanwhile, away from the bluster, as Atticks says, brewers used the months of post-session, legislative downtime to meet with lawmakers and educate them on all things craft beer. It was fruitful to be proactive instead of just putting out fires on the defensive. Why is this even necessary? I mean, bakers don’t have to battle Annapolis over how much bread they can produce, or how and where they can sell it. The answer is simple: cuz, alcohol. Maryland established a three-tier system in the wake of Prohibition which legally divides the beer biz into a trio of non-overlapping entities: producers (brewers), distributors (wholesalers with trucks and warehouses) and retailers (bars and liquor stores). One justification for such a system was to prevent a pernicious, pre-Prohibition situation where brewers owned their own taverns and flooded them with super cheap beer, an act seen as promoting drunkenness. Mandating a middleman, by design, adds cost to the prospect of tippling one too many. Of course, this logic fails in the craft age. Consumers aiming to abuse alcohol will find it much cheaper and easier to pound pitchers of Bud Light at the corner bar–o say nothing of buying plastic-bottle vodka at a package store–than to shell out $7 for a single pint of IPA at a brewery taproom. Still, the system has been in place for generations and one person’s lucrative status quo is another’s potentially stifling set of regulations. Craft brewing isn’t going anywhere. Neither are bars, of course. And in a craft age when literally thousands of beers brands are available, an efficient distributor that can effectively curate this liquid armada is invaluable. As long as alcohol diplomacy replaces acrimony in Annapolis, the glass is half full.